I stayed on an all-inclusive, and the food was good always something to choose from. Staff were excellent nothing was too much trouble. The entertainment leaves a lot to be desired, not to everyone’s choice last alternative is a piano playing every night in the lobby. The biggest disappointment was the hygiene of the pool, it was never cleaned daily and often had cups and debris floating from the previous evenings revellers, having to be fished out by parents whose children wanted to swim. Pool side area in the two weeks we were there was never cleaned only when it rained. This hotel offers a very good standard over all and anyone going here will not be disapointed. Never have I been to a hotel anywhere in the world to come home at 3 in the morning to see maids still working cleaning the floors and polishing the tables. Rooms are cleaned every day and done very well with new towels each morning and towel displays done on the bed. A Razor kit each day if you need one ,soap, shampoo and bath soak all all refilled daily. A full size ironing board and Iron are in each room so you forget having to take on with you. walks. at the top of the figure eight is the lobby which has the main buffet the reception the coffee lounge the 24hr lobby bar a shop and a hair dressers. Also there is one of the a la cartes here which is on a French theme. The food here was very good but as in all of Cuba you must remember you are not in cuba for the food. With all its problems food is never going to be like some of the other islands around or even mexico but they try hard and give you the best they have. The choice is out of this world and not once did I have a bad meal. If you dont like the look of something move on there is so much to choose from. 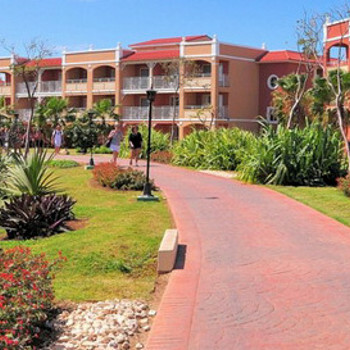 The location is near the end of the Varadero strip with only two hotels open after it and two under construction. Its a good 15 to 20 mins ride on the open topped bus in to down town varadero but its a nice run and the bus runs til 9pm . Only thing that is a problem is that the hotel is built right next to the mangon lagoon so it does suffer from mosquitoes in the evening although the hotel sprays and fogs the grounds every night. Saying that the setting is quite stunning and there is pleanty of greenary to be had and this also helps bring in the humming birds that you will see all over the grounds of the hotel. This hotel has ben open 12 months and it only needs to fine tune a few things one being the entertainment which starts at 9pm and last for 30 to 45 mins then they have a kids disco which lasts all of four songs which was a bit strange. The staff well they are great although we did hear of one or two that seemed to only want to give service if they where tipped. We did not come across anything like that and in fact when I asked the pool barman where I could by the best tequila as they had non in the hotel shop he vanished and came back 5 mins later with a bottle. "This is yours from my family to you". I would go back to this hotel tomorrow I loved it here the place has everything you could need from the quite pool to the activity pool and its water slide to a fantastic gym and food and drink all day long if wanted.